As we continue our journey to change provider reimbursement to a “Pay for Value” system, the lines between health insurers and health care providers are blurring. Physician/hospital systems, like Partners HealthCare, where I work, are taking on risk for populations of patients through contracts with the Federal government and local payers. According to Secretary of Health & Human Services, Sylvia Burwell, this trend is going to continue. She stated recently that HHS set a goal of tying 85% of all traditional Medicare payments to quality or value by 2016 and 90% by 2018. Since the whole insurance industry is based on risk, we inevitably have to start thinking more like insurers if we’re going to be taking on risk. So I cleared my calendar and attended as many content sessions as I could at the AHIP conference, in hopes that I’d soak up knowledge on how these companies approach their craft. Sadly, I didn’t learn much. Not because I didn’t listen and not because the speakers were less than talented. I walked away feeling like I hadn’t learned anything because I felt I had gone to a foreign land and was listening to talks in a foreign tongue. I simply couldn’t decipher the health plan lingo. This worries me because it’s time for these two sectors of the industry to collaborate more. 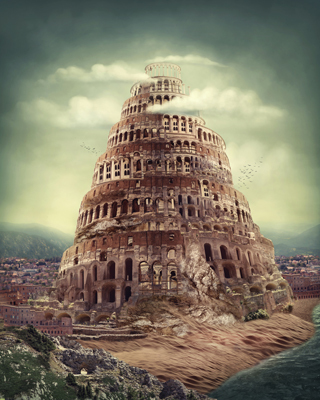 If we can’t understand one another though, it will indeed feel like the Tower of Babel. At the highest level, it seems like we should be natural collaborators, as we bring very complimentary skills to the shared goal of building a health care system. As providers, we excel at understanding physiology, pathophysiology diagnosis and therapy. In most cases, we have strong relationships with the end users of the services offered, our patients, which often includes a high degree of trust. When someone’s doctor recommends a course of action, most people at least take it seriously and many often follow that path. Payers, on the other hand, have always been challenged connecting with their members (you see, we are all a member, a consumer and a patient – all in different contexts – an example of the babbling). Payers excel at understanding risk and setting premium costs, something we as providers have no feel for. But if we’re going to take on risk, we’ll have to learn. Can these former negotiating foes come together to help improve your health? The current landscape does not lead to enthusiasm. I’ll use some telehealth implementations as examples. Several national payers are adopting virtual visits as a tool for their members. For me, this is a dream come true! BUT, most payers are doing so in collaboration with one of the major vendors in the space and creating shadow physician networks to offer the service to their MEMBERS. When that member’s primary care doctor eventually sees them in the office, she will be puzzled that her PATIENT had an encounter via their health plan that she did not know about. Walgreens just rolled out a virtual visit program as well. This could create even more confusion, as it brings in a new entrant — the pharmacy — into the battleground for that relationship. Will EMR interoperability solve this confusion? It certainly helps, but I’m also concerned about mixed messaging to the consumer/patient/member. It seems like we’re all fighting for your attention, which may lead to conflicting messages. This reminds me of a time, about 25 years ago, when this new thing called disease management sprung up. Payers were frustrated by the cost of managing patients (members) with chronic illness. They got no help from providers, so they took matters into their own hands, hiring call centers staffed with nurses to contact patients/members with tips on how to manage their illness, and often sent generic brochures about high blood pressure and other conditions. Payers may have influenced the care of some patients/members, but no one was ever able to prove that this was an effective strategy. There were numerous stories about patients receiving conflicting advice from these ‘disease managers’ compared to their own doctor’s advice, leaving patients confused. Doctors would get faxes from these same disease management companies and (perhaps arrogantly) throw them in the waste basket without reading them. As a result, the disease management industry collapsed in the middle to latter half of the last decade. In the meantime, we now have workplace wellness programs, virtual visits offered by your health plan, retail clinics, virtual visits offered by pharmacies and — dare we forget — advice your doctor gives you, which should be more in tune with prevention now that providers are taking on risk. See what I mean by a Tower of Babel? How do we fix it? The race for the healthcare consumer has started. Walmart, CVS, Walgreens are just a few of the early entrants. Recently, Tim Cook, Apple CEO, indicated healthcare was on Apple’s radar screen. Hoping for better communications between providers and insurers is a monumental waste of time. Consumers are being given higher deductibles and larger co-insurance amounts by their employers. This is in hopes of creating a better healthcare shopper. Self-insured employers are engaging firms to cut through the fog of healthcare pricing to find the best deals for their employees. The lights have come on for the many buyers of health insurance (government and business). Historically, the health insurance industry’s ability to continue to increase profitability required an increase in premiums and this was only made possible by the increase in prices for care. Since the sustainability of this relationship is now being threatened, all historical bets are off. Retailers that are used to chasing the customer for their business are now chasing the healthcare customer that’s spending a $1,000 to $5,000 of their own money. The communication that’s most important now is the one with the consumer/patient. There is no Tower of Babel just a common consumer business language common in most peoples’ every day purchases. I was in complete agreement up until the statement that there is no tower of babel. For me, the primary undefined term is “value”. What does “Pay for Value” really mean? Without some agreement on that, how can one assess risk? Indeed, I don’t know where risk enters the picture so far as the provider is concerned, unless “quality or value” is defined in terms of risk. For example, if with generally accepted treatment 80% of 50-year old males suffering from Condition X can be “cured” (whatever that means), and provider Y only “cures” 75%, presumably Y’s payments are reduced. Is this what they’re driving at? I hope not – for there are so many variables involved in describing, almost defining, the patient, that I don’t see how the average provider or group of providers can have a large enough sample of patients to make any such definition of “quality or value” work. I guess I’m stuck in the thinking of the past. I’ve long thought that medical malpractice should be replaced by some sort of workers’ comp approach. But at least in classic tort litigation, the facts surrounding the specific patient and her treatment are what count – that and generally accepted treatment standards. In brief, was the care provided up to the generally accepted standards in the area, and if not, was the patient harmed? It sounds as if the proposal will punish providers who live up to the standards and who do not harm patients”: they will still be penalized if “value” is missing. I don’t imagine value to be defined that tightly. It does bring up a great thread for discussion, though. I understand your disappointment at the end runs of retail pharma and health plans to go around traditional provider networks to reach patients. It is kind of inevitable given the inability of change agents to influence the way providers are financially incentivized to focus on acute care and heroic care but not prevention or wellness. But great to see the language of disruption and uncertainty entering our discussions, including the “Tower of Babel”. I believe we have only began to scratch the surface regarding our national discussion of the existing structural defects in our US healthcare system that that have left the patients, tax payers, and employers, in particular, marginalized and all other stakeholders prosperous and little inclined to discuss price transparency and outcomes. I recently posted on LinkedIn a slide from a talk i gave recently that took a stab at some of the structural problems (framed as “Four Horses of the Apocalypse” in healthcare – particularly addressing our failure to prevent the tsunami of preventable medical complications of common lifestyle related chronic diseases such as CVD and diabetes – ie the challenge of the 21st Century. What are the 4 Horsemen ? 1) .Our billing code system is run by a small, closed special interest group of medical specialists rallied around the American Medical Association. it strongly rewards specialist care but not prevention efforts or primary care. 4) Patients lack any real economic consequences (+ or -) for their health decisions. We do need to start ratcheting up the heat around the need for change in the way all stakeholders in the US healthcare system are incentivized and how our current billing code system and healthcare insurance system shapes the behaviors of everyone. Well stated. Thanks for taking the time to contribute. When we get into discussions of value / quality, we walk on subjective ground. To some it’s a Ford to others a Mercedes Benz. You know sometimes it’s good not to grow up in the industry (healthcare or insurance) as it allows you to see things from a fresh perspective. In the 1990’s I started a company that grew very large and represented tens of thousands of payors, insurance companies, TPA’s, large self insured companies. We literally issued hundreds of thousands of healthcare checks each month. I recognized the Tower of Babal in 1992 between patients, providers, employers and insurers, and at the risk of sounding arrogant we literally found the cure for it and documented it in large studies. And yes it’s amazing that 23 years later it has only gotten worse in general. But this would take time to explain. And I do agree that having a virtual visit with your own primary care, specialist or medical provider is much better than a “doc in a box” but there is a place for both I suppose depending on consumer preference and urgency. I for one vote for “my doctor”. You were ahead of the curve, it appears. Thanks for your thoughts. Unless players are willing to compromise of FFS contracting and share information for the sake of truly reducing the cost of healthcare it seems that everyone’s efforts to “solve healthcare” and “make the world a better place” are unfounded. Unless we integrate solutions into EHR we seem to only compound fragmentation and the challenges of interoperability. Everyone wants to get rich off of healthcare, pass it on to the payers and then blame them for the ever increasing healthcare spend trend. P.S. Any thoughts on Google’s announcement that they are launching a new wearable device? Joe, What you’re describing is a by-product of the “consumer revolution” in healthcare. You might also just simply call it “competition”…and it’s not going away. 2) System integration — e.g., ACOs, medical homes, etc. While there seems to be tension in these approaches, if you think about it they are not necessarily incompatible. I anticipate a lot of experimentation, hybrid approaches, and pluralistic offerings in the market. I concur with your assessment. However, the disruption of change will be prolonged and difficult for both providers and patients. We are only a few years away from an emerging, significant millennial group who consume their healthcare the same way they consume everything else – via their mobile on a ad hoc basis, with providers that meet them on their definition of the competitive field. These consumers will begin to think of their telemedicine providers as their primary care, and bricks and mortar based services as something to avoid unless absolutely necessary. The word ‘telemedicine’ will begin to disappear and telecomm based exchanges with healthcare providers will be the new ‘front end’ of a brand (yes, brand) experience. Most alarming to many in traditional care settings, will be that the new provider interlopers will begin seriously impacting and changing traditional referral patterns. There are far too many examples to argue that the trend is not already underway. Reblogged this on bigadata healthcare software solutions kathmandu nepal lava prasad kafle. As a physician, I see a lot of changes. However, I think there are sum assumptions that may not be necessarily true. I hear the terminology of value in medicine being thrown around a lot. What is value? What is convenience? And what is good medical care? I think there terms are being interchanged. Convenience may be telehealth and Walmart medicine. Walmart medicine may even be a value, it may not be a value, it depends upon how you measure it. It may or may not be good medical care. A consumer getting what they want, when they want it may be convenient, but not necessarily a value or good medical care. An example of this is getting care through the ER. It may be convenient, 24 /7 but not necessarily a value or even good medical care. Getting a script at a Walmart may seem convenient and value but it may not be good medical care. Getting treated for something you want, but not necessary for what you need. Individual consumers, may not see or understand the difference as long as they get what they want. Getting care a University paying $1000 for a visit to a specialist may not seem like a value or even convenient, but why to patients line up for months to be seen, paying out of pocket. Maybe they see this as a value or maybe as good medical care. I have a small practice in a suburban area surrounded by 15 Urgent Care and Walkin Clinics , telehealth providers and 25+ hospital group practices, yet I have a 100+ day waiting list for new patients. This may sound like it is not convenient when you could be seen at a competing practice the same day. Maybe it is a good value or just good care. I think a lot of these assumptions under estimate the reason why patients choose their physicians and where they get their care. Very well written and thoughtful. At the end of the day, all patients go their physicians based on the trust factor. Irrespective of all the incentives given by payers, patients still are willing to pay for the physicians they trust and most of this trust comes from a ‘word of mouth’ publicity. We really have a challenge fixing this Tower of Babel..